The bottom line is the ride. Enjoy an 80% smoother ride and a 75% safer tow. Driver fatigue is greatly reduced and your family, friends, and animals will enjoy the smoother, less bouncy ride. 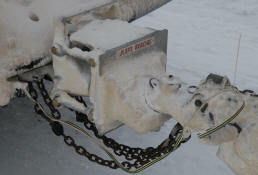 The wear and tear on your truck and trailer will be greatly reduced. You can add air springs to the truck and to the trailer, but this will not fix the problem if you still have a hard connection hitch. Fix the problem at the source, with our Air Ride Trailer Hitches you do not need air suspension on the trailer or truck unless you just want all the comfort you can get and don’t mind paying for it.